Nearly every mile of this vast park is wilderness. In fact, visitors can backpack to a spot farther from a road than 48 other National Parks. The theme of the area is big - big trees and big canyons is what inspired the preservation of two different areas. In 1943, the separate parks began to be jointly administered but offer the beauty of two parks in one. The park offers nearly 800 miles of trails and stunning backcountry like no other area in the U.S. Mount Whitney, the highest peak in the U.S. south of Alaska, rises at the eastern border and is accessible by backpackers within one or two days. 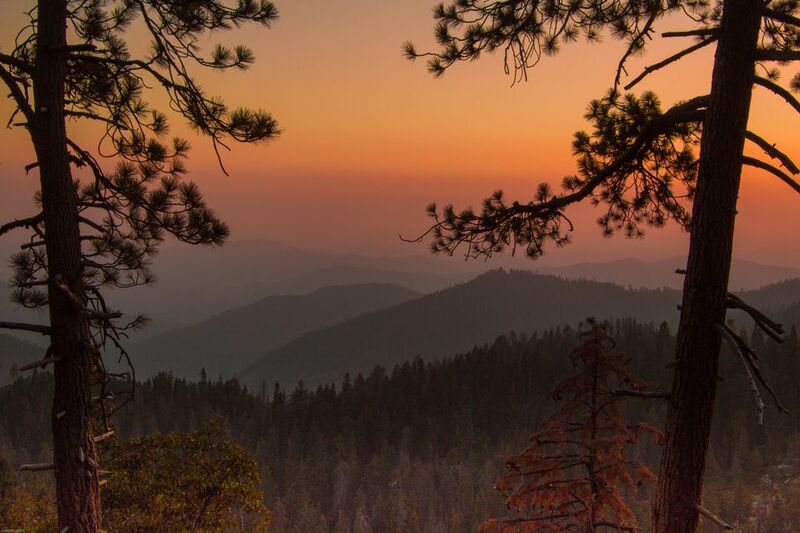 Even though they were created by separate acts of Congress, Sequoia and Kings Canyon share miles of boundary and are managed as one park. Sequoia was the second national park designated in the United States and was established on September 25, 1890. It was also given wilderness designation on September 28, 1984, and designated a Biosphere Reserve in 1976. Kings Canyon National Park was established as General Grant National Park on October 1, 1890. It’s name was changed and combined with additional land on March 4, 1940. The area was designated a Biosphere Reserve in 1976 and later given wilderness designation on September 28, 1984. The park is open year-round, 24-hours a day. Spring (good for wildflowers) through fall (golden foliage) is the best time for sequoia viewing, while December to April offers opportunities for cross-country skiing and snowshoeing in Grant Grove and in the Giant Forest area. Visitors can expect the park to be busy and crowded during the months of July and August. Two highways provide access to the parks. Both become the Generals Highway inside the parks' boundaries and is often referred to as "the road between the parks." Highway 180 enters Kings Canyon National Park from the northwest via Fresno and provides access to the farthest eastern vehicle-accessible point near Cedar Grove. There are no roads that cross east-to-west through the parks in the Sierra Nevada Mountains. Visitors are charged an entrance fee when visiting Sequoia and Kings Canyon. The one-time fee is valid for seven days upon purchase. Visitors traveling by vehicle will be charged $20, which includes entrance into Sequoia, Kings Canyon, and the Hume Lake District of Sequoia National Forest/Giant Sequoia National Monument. Visitors traveling by foot, motorcycle, bicycle, or for individuals traveling together in a vehicle as a non-commercial, organized group will be charged $10, also valid for Sequoia, Kings Canyon, and the Hume Lake District of Sequoia National Forest/Giant Sequoia National Monument. If you plan on visiting the park multiple times throughout the year, consider purchasing the $30 Sequoia and Kings Canyon Annual Pass. The pass is valid for Sequoia, Kings Canyon, and the Hume Lake District of Sequoia National Forest/Giant Sequoia National Monument. It admits all passengers in a private vehicle and is valid for one year from month of purchase. America the Beautiful – National Parks and Federal Recreational Lands Passes are also accepted in the park and will waive entrance fees. Four Guardsmen: A quartet of sequoias that stand near the entrance to Giant Forest. Centennial Stump: A sequoia cut down for te 1875 Centennial in Philadelphia. Big Stump Trail: A 1-mile loop that serves as a reminder of how logging affected the natural beauty of the area. Cedar Grove Village: Walk or bike any distance of this area and take in the beauty of this hidden valley. Hanging Rock: A high granite area perfect for viewin the Sierra Nevada. Mineral King Ranger Station: Stop by here to see if a ranger-guided walk is scheduled for that day. Eagle Sink Holes: Have fun in this area. See where water disappears just as suddenly as the creek appears. There are four lodges inside the park offering convenience and beauty. The Wuksachi Lodge is located in the Giant Forest area of Sequoia National Park and offers 102 guest rooms, a full-service restaurant, cocktail lounge, and a retail/ski shop. The John Muir Lodge is located in the Grant Grove area of Kings Canyon National Park and offers 36 hotel rooms and a restaurant. The Grant Grove Cabins are located in the Grant Grove area of Kings Canyon National Park. The cabins are half a mile from a sequoia grove, visitor center, market, restaurant, gift shop, and post office. Guests can choose from six types of cabins some of which are open year-round. Cedar Grove Lodge is located deep in the canyon of the Kings Canyon and offers 18 hotel rooms, a counter-service restaurant, market, and gift shop. For visitors interested in camping, the parks have 14 campgrounds, majority of which are first-come, first-served. In the Foothils area, Potwisha, Buckeye Flat, and South Fork are available from $12-$18 per night. In the Mineral King area, Atwell Mill and Cold Spring are available mid-May to late October for $12 per night. In the Giant Forest, Lodgepole and Dorst are available for $20 per night. In Grant Grove, Azalea, Crystal Springs, and Sunset are available for $18 per night. In the Cedar Grove area, Sentinel, Sheep Creek, Canyon View, and Moraine are available for $18 per night. Azalea and Potwisha are open year-round. Remember to call (559) 565-3341 before you plan to visit.